The Seat: [update: July 2013] Since our review this cabin has been re-fitted with new leather seats featuring personal entertainment systems. But as shown in this 747 Delta seating chart this particular seat remains situated in the same place although seat width may suffer (assuming that your personal TV and tray table are in the armrest. [original review] 36A aboard this Delta 747 is rated as a premium seat on most seat-map sites like seatguru.com. Being a skeptic, I was anxious to see how much space I would find between the seat and the exit row slide…You see, I’ve been burned before. In fact, the video seat reviews that we regularly obsess over were inspired by the time I found myself stuck in 19F on this Delta 757. I was happy to find that this seat was NOT close enough to the exit slide to be a nuisance, although it might be of slightly lesser value to someone much over 6′. There’s a small gap between the exit slide and row 35 so if you can do so without bothering the person in 35B, You’ll have all the advantages of an aisle seat as well as a window seat. Speaking of the window, You’ll have to turn your head just slightly further to see outside but not difficult. Movies aren’t easy to view from this seat. There’s a projection screen on the bulkhead wall to your right that you can see at an angle, but it’s difficult to sit in that position for any amount of time. Until Delta makes improvements to the in-flight entertainment we recommend bringing your own entertainment. Service: Meals were served and help was provided in a friendly and timely manner. Nothing more or less than I could have hoped for. 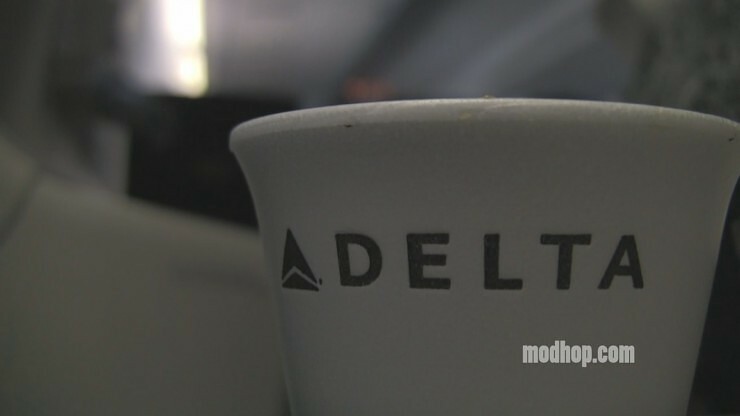 Notes: At the time of this post Delta has begun re-fitting these aircraft with new slimline seats that will provide slightly more legroom in economy the new design. The new seats will be upholstered in Delta’s signature blue leather and fitted with personal TV/Entertainment systems with movies, games, maps and audio. Until the installation is complete you’ll experience the older Northwest Airlines era cloth seats with limited audio and shared movies overhead. Summary: It appears that row 35 in seats B,C,H & J are superior seats with added legroom and easy aisle access and might be a better first choice. That said, 36A is a very good economy seat and the room around it gives it sort of an exclusive feel (and by that we’re not implying it’s anything like being in Business Class). It should also be noted that this and it’s opposite, 36K are the only seats in this row with extra legroom so if you’re traveling with (and sitting next to) a companion, one of you will be in a normal economy seat. Strategy: Delta Medallion (elite) members have first access to these seats but they can be requested at the gate. If you’re not a medallion level member try getting to the gate early and requesting something in row 35 (Seats B, C, H or J only) , then 36A and/or K if those aren’t available. SkyTeam Elite members and elite members of other specific airlines (such as Alaska Airlines) also have first crack at these premium seats. How I got it: Delta Medallion Status. Just came across your site; thanks for the reviews. Because of this one I just grabbed 35B for two upcoming NRT-JFK trips. 36a looked a little tight. Quick question: Why is 22b,j always blocked out when trying to book these Econ Comfort seats? Is this a two seat row now? Hey Steve- Thanks for the comment and I’m glad I could help you find the right seat. Let me know how row 35 is for you. As for your question, it’s a good one. My best guess would be capacity control or to reserve for those with special needs. There’s been some discussion online about whether Delta is holding the middle seat open for premium “medallion” customers so that they’ll have a little extra room, but I’m not sure why they would do it in just one row. I put in a request to the Delta newsroom and online crews so I’ll post here if they give me a concrete answer. Cheers! Thanks for this info – very helpful. I have the option of 35J or 36A and I’m leaning toward 36A even though I’ve read your suggestion to go with 35. Here’s my logic for 36: there’s still extra leg room (I’m only 5’7″); if I want to sleep I can actually lean against the wall of the plane which I can’t do in 35; and if I have my bag on the floor during the flight it feels a little less accessible to those walking by in 36 (especially if I’m sleeping). Seems the only advantages of 35 are that it has a window (right?) and a little more leg room. How does my logic sound? Sounds perfectly reasonable. 36 is an overall better seat If you don’t mind having to crawl around or over people to get out, although you MAY be able to work yourself around the exit door (Depends on who or what’s in row 35). I actually really liked 36A and would easily choose it (or 36J) again. And yes, it’s a much better choice if you want to prop yourself up against the wall to sleep. Thanks for the info. I just flew the JFK-NRT-SIN route. I had seat 35J and the legroom was wonderful. The inflight entertainment and the meals were better than expected. I have flown International business class several times on Delta, Malaysia and Singapore airlines. So my exception of economy fare was not very high. Delta surprised me and the fight was better than bearable. Thanks for the great review! I’m going to be flying on this plane in December, and being 6″4 i’m planning on upgrading to economy comfort (all the exit rows are already taken 🙁 ) I’m thinking of taking 22 JK, my only fear is that i heard the armrests are immovable but i’m not sure if that’s a big deal or not… Should I take those two, or a regular economy comfort seat a row back?